Rich in ANTIOXIDANTS, CALCIUM, FIBER, FOLIC ACID, IRON, POTASSIUM and VITAMIN C, this cruciferous vegetable is a great all-around nutrient (one of the very few white things on the planet that’s actually Good for something!!..LOL). 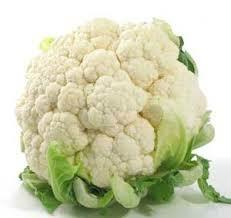 Cauliflower may be eaten raw or cooked lightly. If you enjoy mashed potatoes, you’ll Love mashed cauliflower (done the same way). It makes an excellent companion to a multitude of lovely dips and sauces, too! This vegetable is also pretty filling. Try adding it to your meals several times a week and watch the benefits.